Zephyrhills 100th Anniversary: Remembering Jimmy Walker - Zephyrhills, Florida 100th Anniversary! Many residents will recall that Zephyrhills had one public school for most of its history; and all students attended the site at 38505 Tenth Ave. (the current site of R.B. Stewart Middle School). For several years an elementary school on the campus was officially dubbed East Zephyrhills Elementary. Zephyrhills residents undoubtedly have many memories of going through all 12 years of education at that location. James B. 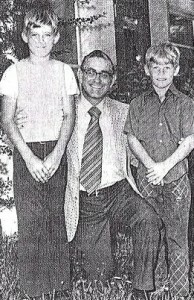 “Jimmy” Walker, who had been principal of East Zephyrhills Elementary, passed away June 20, 2009. Services were held at Sunlake Baptist Church in Lutz on June 23, 2009. Mr. Walker was a native of Birmingham, Alabama and served in the Sumter County Schools as principal of Coleman Elementary School before coming to Zephyrhills. He graduated from Phillips HIgh School in Birmingham and had a Bachelor’s Degree from Auburn University. Quite an athlete, he held records in track and field and later served in the U.S. Army Reserve as a forward observer and lieutenant. He was a Deacon in the Baptist Church. Mr. Walker was very proud of the accomplisments of his students at East Zephyrhills Elementary. One such instance was in October 1972 when student Marple Butch Miller, Jr. prevented another student, Ronnie Smith, from nearly drowning in the HIillsborough River. Mr. Walker thought the event was heroic and interesting enough that he contacted area newpapers so they could do articles about it. An article about Miller’s rescue of Smith appeared in the Oct. 12, 1972 edition of The Zephyrhills News. Mr. Walker, who retired from Pasco County Schools, is survived by his wife, Sarah M. “Bettie” Walker, son, Mikel Walker, two daughters, Jamie Susanne Walker O’Carroll and Jimmy Beth Wilson, his brother, Ray E. Walker, and 18 grandchildren. Mikel graduated from Zephyrhills High School in 1973 and Susanne graduated from ZHS in 1978. By Madonna Jervis Wise and Clereen Morrill Brunty of the 100th Anniversary Committee, ZHS. Article originally appeared in the Zephyrhills News on July 16, 2009. I just wanted to thank you for including my Father in your 100th Anniversary. Zephyrhills was a pivital point in mine and Daddy’s lives. We have so many joyous memories . Land Marks , buildings and people change or fade away , memories live on as”the way things once used to be”.